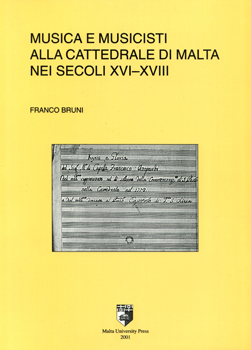 This study traces the history of the musical chapel of the Cathedral of Malta from the first musical activities, at the end of the 16th century, up to the 18th century. This work is the result of systematic research carried out on the arhicval documents as well as on the printed and manuscript music sources. Taking into consideration other local and foreign musical institutions which had many contacts with the Mdina Cathedral, the history of its music chapel offers an interesting example of a very well organised institution, constantly up to date on the most recent musical rends. This reference tool is the result of a two-year research done by the author in collaboration with students of the Music Studies Programme of the University of Malta. 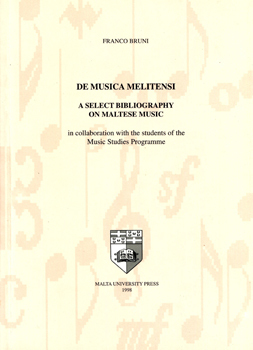 It is the first publication to be dedicated to Maltese music bibliography. It seeks to provide information on what has been studied and to promote further research on Malta's musical heritage. This month the Malta University Press is launching two new books.